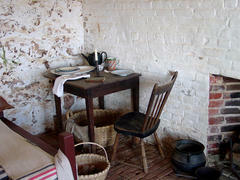 This room, completed in 1802 and located next to the Kitchen, was reserved for Monticello's chief cook. First occupied by Peter Hemings, the room became home in 1809 to the family of Edith (Edy) Fossett, Hemings's successor, and her husband and blacksmith Joseph. The Fossetts were part of an extended family of farm workers, artisans, and house servants. Because of their skills, they had greater access to money than enslaved people without trades. The Fossetts may have supplemented their food rations by hunting, fishing, and gardening. In the evenings, they pursued a variety of activities here, including cooking, sewing and mending, and, as recalled by their son Peter, spelling. Dimensions 10' - 5" x 14' - 4"